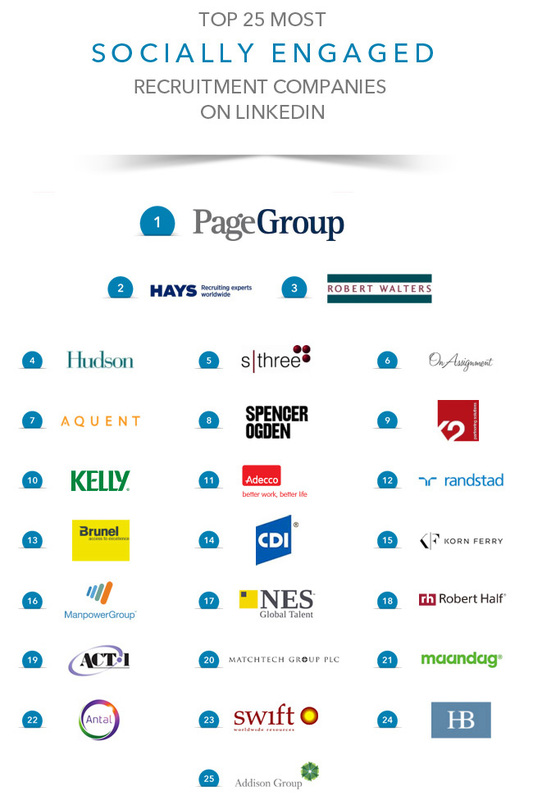 Today, at Social RecruitIn London, we were excited to announce the Top 25 most socially engaged companies in the recruitment industry on LinkedIn. We’re seeing more and more recruitment firms around the world realising the benefits of adopting social media. They’re becoming marketing-led organisations versus sales-led organisations, and they’re able to grow their businesses and better engage their clients and candidates as a result. To come up with the rankings, we looked at a range of metrics including social reach, employee engagement and interactions, talent brand and content marketing power on LinkedIn. Company Page followers, employee activity on LinkedIn, and use of company status updates were key factors in driving social engagement. 1. Focusing on building your LinkedIn follower base. Ninety three percent of recruitment company followers say they are interested in hearing about job opportunities from those companies they follow on LinkedIn. Hays recently became the first staffing firm to reach the incredible milestone of one million followers on LinkedIn, an achievement matched by fewer than 20 other companies in the world. Add a Follow button to your company website. Make it easy for people who visit your website to follow your Company Page by embedding a free “Follow” button. For more details, visit this site. Go social. Cross-promote your Company Page in LinkedIn Groups and on other social platforms like Twitter and Facebook. Have employees spread the word. Ask your team to include a link to your Company Page on their LinkedIn profiles and in all client and candidate communications. They can even embed a Follow button in their email signatures. 2. Sharing relevant, engaging content. Start by thinking about your target audiences. Are you talking to active or passive candidates? Who are they and what are they interested in? What do you know that can help them with their challenges? Companies like PageGroup run highly targeted marketing campaigns on LinkedIn, based on regionally-focused content plans. They identify what their audiences care about, and target content accordingly. The more specific the content, the more likely your key audience will find value in it and engage with it. Recruitment professionals receive 10x the amount of profile visits on LinkedIn; that's a lot of eyes looking at your employees. What can you do to make the most of this traffic? Encourage your employees to share content that’s relevant to their target candidates and clients. They can also leverage their LinkedIn profiles as marketing platforms by sharing information about your firm and their role. Robert Walters, another firm ranked highly on our list, leverages their employees in this way to amplify content and maintain a consistent brand on employees’ profiles.